Norwegian PM declares migrants cannot use religion to reject to jobs. Erna Solberg said while her country is happy to accept migrants they must not expect Norway will pay them any benefits if are refuse work. The Scandinavian country has kept maintained a hard stance on the European migrant crisis and successfully challenged European Union migrant quotas, which enabled them to maintain the regular border checks introduced at the beginning of this year, and designed to limit the flow of irregular migrants. EU law suggests members of the bloc can only bring in emergency frontier controls for an initial period of two months, which can be extended to a maximum of six months in extreme circumstances. Speaking on Euronews’ Global Conversation, Ms Solberg said: “It is part of our normal educational system that you are discussing why people are fleeing from countries, what is the convention what is the responsibilities we have, this is all part of the school curriculum in Norway. Upon being challenged about religious differences between her country and that of arriving migrants, she rebuked: “I do not think it is a complex issue that if you are going to come to country. “You have to work to sustain a living, you cannot say no to jobs like working in a restaurant where they will serve pork or alcohol. “You cannot expect that the Norwegian society will pay you benefits if you are refusing to work for religious reasons. “There are too lower of migrants women working in Norway, we know that some reasons are they have a lot of children, so that is work in itself. Ms Solberg added that around 3,100 refugees are being allowed to make home in Noway as they continue to participate in helping solve the humanitarian crisis. The Scandinavian country is a part of the Schengen Zone, which was created to allow citizens of EU member countries to travel freely without passport checks to other nations within the area. 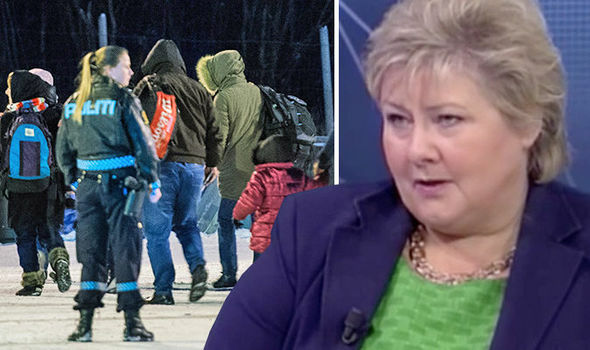 The extra border checks were introduced after Immigration Minister Sylvi Listhaunt vowed to do everything in her power to stop migrants entering Norway, as experts predict more than 8,000 people will seek asylum in 2017. Her views echoed that of Ms Solberg, after she took to social media to tell potential newcomers that they couldn’t dictate terms to the country, saying in Norway “we drink and eat pork”. She wrote on Twitter: “I believe those who come to Norway must integrate into our society. Previous Previous post: Want To Prevent The Flu? Skip The Supplements, Eat Your Veggies. Next Next post: Finland to Become the First Country in the World to Get Rid of All School Subjects.